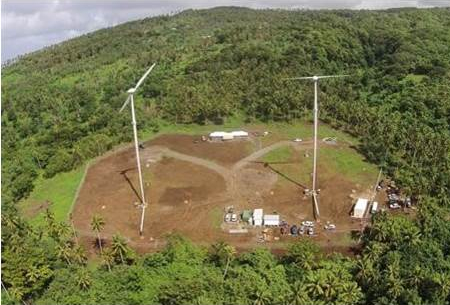 The Aleipata Wind Farm is the first wind farm to be commissioned in the Independent State of Samoa. The Vergnet project was completed on the island of Upolu, which is home to 75% of the total population. This project has been financed by the Abu Dhabi Fund for Development. The wind farm was commissioned in 2014 by Vergnet and benefits the population by delivering $475,000 (U.S.) in annual fuel savings with dioxide savings of 1000 tonnes annually. Samoa is part of the Small Island Developing States (SIDS) low-lying coastal countries that tend to share similar sustainable development challenges, including small but growing populations, limited resources, remoteness, susceptibility to natural disasters, vulnerability to external shocks, excessive dependence on international trade, and fragile environments. Renewable technologies have the advantage of providing energy at a lower cost than fossil fuels and making SIDS more sustainable. The project was installed in Western Samoa and consists of 2 GEV MP C 275 kW wind turbines, supplying 1,500 MWh of power per year. Vergnet is committed to developing the most technologically advanced, state-of-the-art designs for each project, and delivered a tailored design. Vergnet’s experienced engineers adapted the Aleipata Wind Farm system and the project specifications to meet the site requirements and conditions. The wind farm utilises Vergnet’s patented Hybrid Wizard™ technology to provide cheaper electricity and security of supply for the local population. The first self-adaptive hybrid controller maximises the penetration of wind resources in real time to develop a reliable source of power. As a global renewable energy solutions provider, Vergnet adapted a renewable energy solution that helps to reduce and secure energy costs for people, communities, businesses and economies like Samoa. The new wind farm delivered by Masdar and funded by the Abu Dhabi Fund for Development is a significant step forward in Samoa’s transition to a more sustainable energy future. This has been possible thanks to the support of Abu Dhabi and the United Arab Emirates, and their commitment to advancing sustainable development. Access to renewable energy is vital to our long-term economic development, even beyond the substantial gains realised by cutting our dependence on imported fuel.